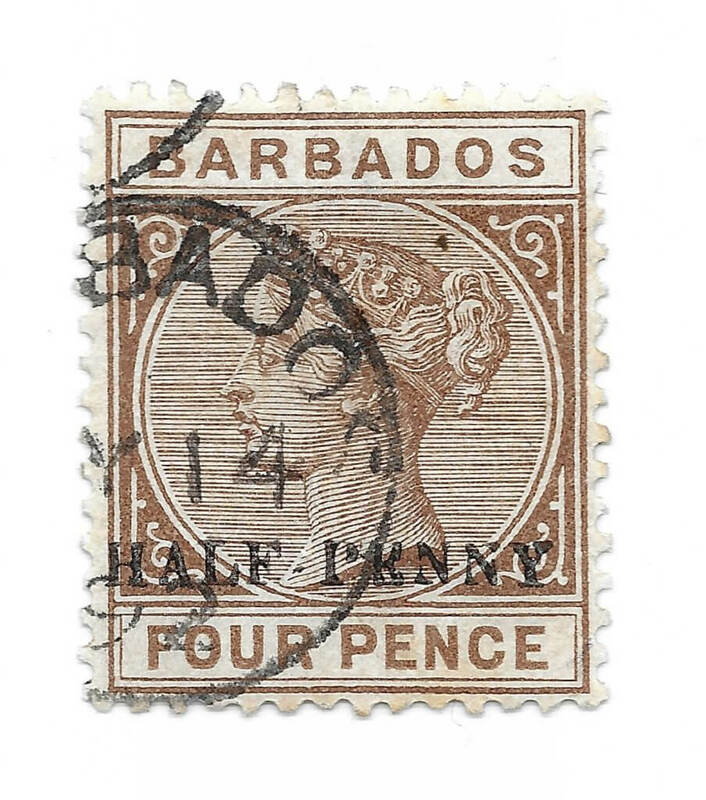 Many stamp issuing countries have had need to use overprints at some time in their history and Barbados is no exception. Typically, overprints were used to indicate a different financial value than the face value at which the stamp was printed. In many cases this was due to a shortage of stamps being available at the correct rate for the prevailing postal charge. A great example of this was that in 1896 Barbados adopted the new UPU regulation for printed newspaper rate which dropped from ½d to ¼d, despite the fact that there were no ¼d stamps available on the island. 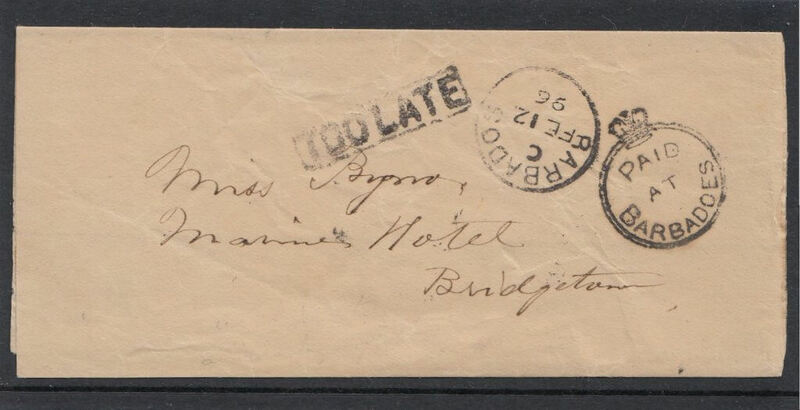 To that point the lowest value for anything that was posted was ½d so there had never been a need to print a lower value stamp. In the interim, whilst they waited for new stocks to be send from the printers in the UK (by ship of course), Barbados took the decision to use the Crowned Circle canceller for a short period and this resulted in a number of covers and wrappers which we still see today, with no stamps attached. Other countries, faced with stamp shortages, have either bisected stamps, overprinted stamps or used alternative cancels. A great example of an overprint is the iconic Seal of the Colony stamp issued during the reign of George VI, which was overprinted at a lower rate due to a shortage of the lower value 1d stamp. 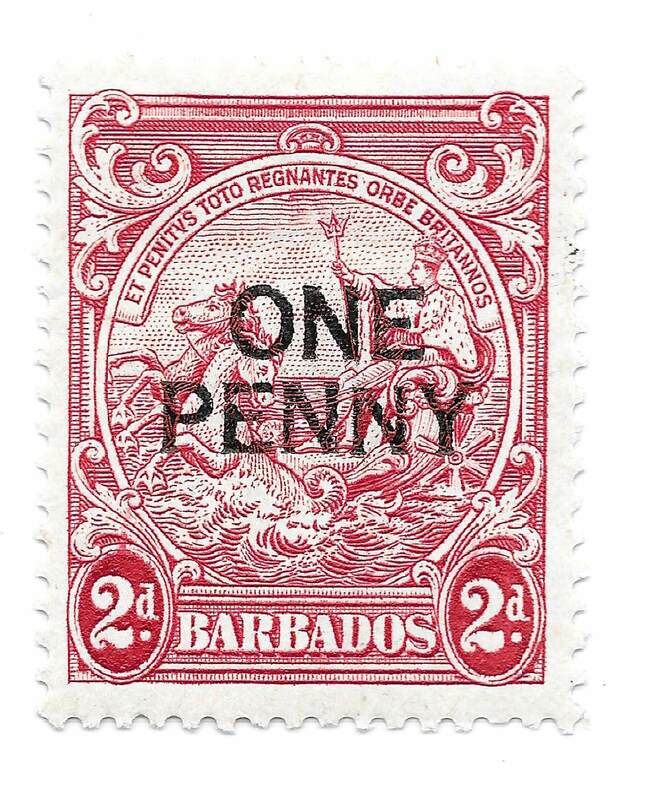 In this case the original stamp SG250e was overprinted locally with a lower value of “ONE PENNY”, given the new stamp Barbados SG264e. The printing resulted in a number of catalogued varieties as the overprint was not always as consistent as they might have hoped. In many cases these overprinted stamps and particularly the catalogued varieties, are worth more than the basic stamps and so it has also led to a number of forgeries being created. Recently, a reader of this website, Paul, sent in some images of stamps he had found in a collection and asked for an opinion. He had SG104 with a ‘K’ instead of an ‘E’ in the overprint and SG 264e with a ‘dropped NY’ in the overprint. Both are forgeries – sorry the font is wrong on SG 104a attached. If you compare the two the vertical lines on the one you sent me, they are curved and the serifs are rounded in the corners. The genuine are squared rather than rounded and the vertical lines creating the letters are straight – nice try but if I hadn’t spent the past year looking at it then I would have been drawn in as well. Now the reason I say this is a forgery is because the printing wasn’t done from type set – it was done from printing slugs – so one typeset was used to produce 120 copies of “ONE PENNY” and then these were formatted into the printing plate – so we end up with a series of minor constant flaws. Amazing knowledge and it solved the mystery of whether these two stamps were unique philatelic finds or forgeries designed to make a relatively inexpensive stamp appear to be hugely valuable. Who knows, perhaps they are unique and I do now have my once-in-a-lifetime-find after all ! And they do make a nice story for my societies´ magazine. We agree Paul we think they make a fabulous story and give an insight into the myriad complexities involved in the overprints, not only of Barbados stamps, but many other countries around the world. Being left handed and maybe cockeyed, On SG264e the first N in Penny looks raised rather than a dropped NY. The Y looks incomplete at the top but in line with the E. Seen an entire sheet of this overprint and hadn’t seen such a variety, but I think its just a poorly stamped surcharge rather than a forgery. A smear job so to speak. SG104a the K appears to be over the cancel.